Rear Admiral Rakesh Chopra , IN, VSM, (RETD), will be attending the Oxford Leverhulme Programme on the Changing Character of War as a Visiting Research fellow in Michaelmas, Term 2007. After serving in the Indian Navy for 38 years, on retirement he took up appointment on the faculty of XLRI Jamshedpur, one amongst the top five B-schools in India, as Professor of Strategy and was subsequently appointed as Chairperson of the Strategy Area. He studied at Bishop Cotton School, Simla. An alumnus of the National Defence Academy and the Defence Services Staff College, he was a founding member and Chief Instructor of the College of Naval Warfare at Karanja, Mumbai. He has also been one of the guiding members on the Directing Staff of the Staff College and Chief Instructor of the Navigation & Direction School. A specialist in Navigation & Direction and diving, he has navigated several ships, controlled aircraft from the carrier and commanded three major Indian Ships. He has been moving perfectly between multiple roles assigned to him, as part of his four decade long career with the Navy including National Cadet Corps, Flag Officer Sea Training, Joint Ops, Information Warfare and Weapon systems etc. He commanded a ship in the 1971 Indo Pak war in the Eastern Theatre and was a member of the Indian Peace Keeping Force (IPKF) in Sri Lanka in 1988. Subsequent to this service, he was awarded the Vishisht Seva Medal for exemplary service by the President. He is an MSc from Madras University and an MBA from a prestigious B school in Mumbai. After doing an MPhil from Mumbai University on “Energy Security”, he was awarded PhD for his thesis on ‘The Strategic Significance of Oil and Gas for the Security of India’. 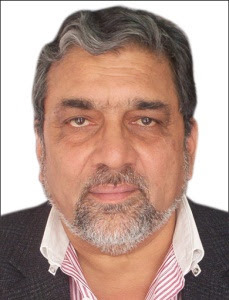 He is a member of two prestigious institutions dealing with strategic and security matters, the USI, New Delhi, and the Institute of Defence Studies and Analyses, New Delhi. He regularly contributes articles on national security and strategy to professional journals and reads papers at national and international seminars. He is also on the Board of Directors of a think tank ‘Peace Operations Institute’ in Washington DC.